Inspired by science, technology and innovation, General Electric has partnered with The Tonight Show with Jimmy Fallon to host a series of Fallonventions segments and launch a new crowdsourced #SomeoneShouldInvent social media campaign. From the campaign’s star power, to the unique use of GIFs to bring crowdsourced inventions to life, General Electric has succeeded in raising the bar on social media innovation once again. During the Fallonventions segments, three young inventors present their creations to Jimmy. The most recent trio on May 8th included an EZ Moo Milk Dispenser, a Pizza Decruster, and the Steth IO, an attachment for your iPhone which mimics a stethoscope by offering audio and a visualization of your heartbeat. Not to be outdone by his 10 and 15-year-old counterparts, Jimmy also shares his own invention ideas, which include Leg Backpacks and Shoe Headlights. It’s not long before hilarity and fun dancing ensues. 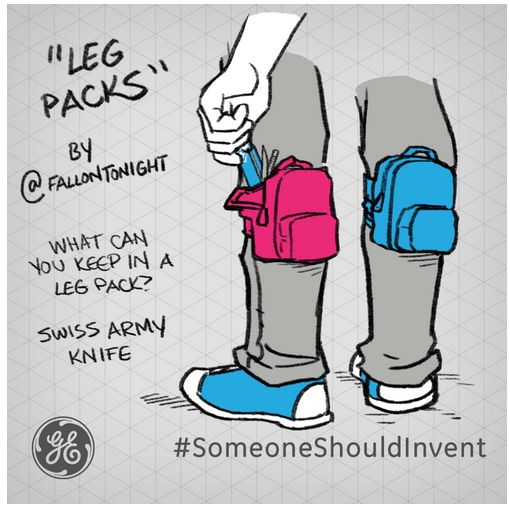 The integration on The Tonight Show with Jimmy Fallon served as the launch for General Electric’s crowdsourced social media campaign where fans of the brand were asked to submit invention suggestions with the dedicated hashtag #SomeoneShouldInvent. Inventions were crowdsourced on Twitter and General Electric then brought fan’s inventions to life by creating personalized GIFs. Each GIF serves as a visual prototype of the invention idea and cites the fan who submitted it. The GIFs have been shared across GE’s Tumblr, Twitter and a dedicated Giphy page. Examples of fan #SomeoneShouldInvent submissions include a Shrinking Car, a Fast Forward Life Remote, Cat Treadmill, and more. What can we take away from this fun and creative campaign? While partnering with The Tonight Show might not be feasible budget wise for many marketers, take inspiration from the strategy behind it. GE partnered with a well-known celebrity influencer with a loyal built in audience to help raise awareness, participation, and social sharing of the campaign. Even if you don’t have budget to work with a celebrity influencer, consider partnership opportunities with key bloggers or thought leaders in your industry. Another approach is to tap into your most passionate advocates to have them help spread the word. Here’s a great article on how to differentiate between influencers vs. advocates, plus pros/cons of working with each group from Ekaterina Walter. Simply having a celebrity or influencer partnership is not enough. With the increasingly visual nature of social media platforms, GE was smart to take invention ideas via text from its fans and bring them to life with animated GIFs. Sure, a static image could have worked, but the pop of animation from the GIF takes the user experience to the next level. The end result transforms the fan’s invention idea into a powerful visual that is highly shareable. When hosting a crowdsourced social media campaign, it’s important to when possible to thank fans for participating. GE did this by offering a shout out on the GIFs created with the user’s Twitter handle as a way to credit them for their creative ideas. Bonus: Fans will be much more likely to share with their social communities if a company goes above and beyond by personalizing a customized visual for them.